In a city like Mega-City One, where 400 million citizens are crowded into huge housing blocks, free space is at a premium. Gardens, greenery and uninhabited space are extremely rare and only available for the wealthiest citizens. Naturally, these areas need to be protected at all costs: enter the Banzai Battalion – tiny droids who will take on anything that threatens their rooftop garden domain! Dredd creator and main scribe John Wagner is known for these tangental offshoots in the Big Meg, returning again and again to concepts or ideas he thinks are particularly funny. 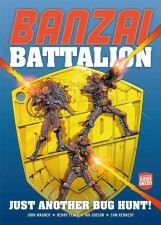 Banzai Battalion saw the light of day in 1999 and obviously riffs on the UK’s boys’ adventure war comics. Though certainly a pleasant diversion when they pop up in 2000 AD, I’m afraid the concept has considerably less Thrill Power when read in a row, as presented in this collection. The repetition of the joke and prevalent theme of the Battalion’s ineffectual uselessness quickly outweigh their welcome. It also doesn’t help that Wagner left all of the robots underdeveloped as characters, apart from their leader Captain Bug Stomper. There are some funny bits as Wagner clearly has fun. However, he strains to inject some story after finishing the first arc, which basically says all that needs to be said about the Banzai Battalion. As an aside, the title is also a bit of a mystery, since these robots are the product of Mega-City technology rather than sharing any connection with the Japanese Hondo City. Maybe Wagner just liked the Stan Lee-style alliteration of the title? After some entertaining episodes in which Bug Stomper flirts with his female trooper colleague, finds an idyllic garden (The Fritz) as their new home and becomes convinced he’s a human, Wagner tries to put all the toys back in the box in the 2006 serial Robot Wars – an unpleasant tale of warfare where the characters are threatened by a newer version of the Banzai Battalion droids. 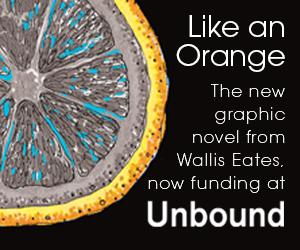 It all comes across as a bit too serious and, with the addition of some rather dark colouring, we were kind of glad the volume finished. As usual, Wagner has a roster of top-notch artistic talent to illustrate his tales. Ian Gibson, Henry Flint and Cam Kennedy all get the undercurrent of parody, with Gibson standing out; his exaggerated line work is perfect for the facial features and over-the-top bodily gestures of the Battalion. 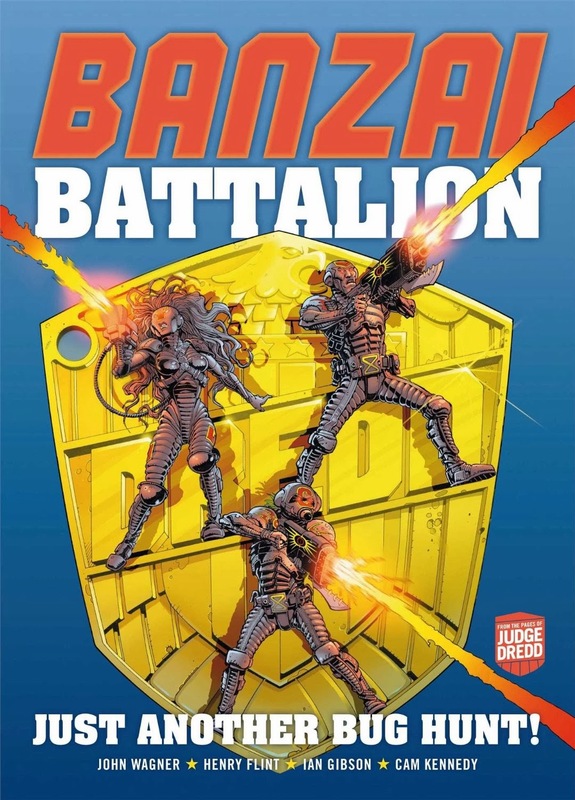 In summary, Banzai Battalion: Just Another Bug Hunt, by John Wagner and various artists, is a boisterous parody of boys’ adventure tales and war serials that is a mildly entertaining read but outstays its welcome near the end. Luckily, Pat Mills’s Ro-Busters fares much better. 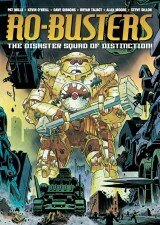 This US edition collects a selection of tales from the infamous disaster squad of distinction and serves as an introduction to the Ro-Busters or a small appetizer for the main course – namely the mammoth 400-page Complete Ro-Busters, which could be heading for a US edition? I covered The Complete Ro-Busters more than – wow! – five years ago right here, by the way. 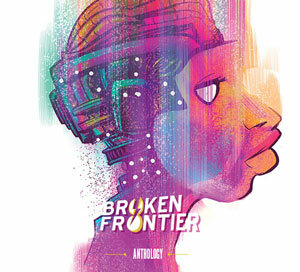 By the end of the 22nd century, robots are a commodity that man can’t live without. Like all technology, newer and better models are constantly being unveiled, making their predecessors obsolete. Enter Ro-Jaws and Hammerstein – an environmental droid with an attitude and a battle-weary war-bot. Both were ready for the scrapheap until Howard Quartz – the billionaire brain in a robot body – bought them both so they could join his international rescue squad. Having launched the series in 1978, Mills has since stated that he wanted to do a ‘Muppets meets Green Wing‘ type of sci-fi and that he found the format restrictive. However, the concept of bickering buddy robots in combination with the Thunderbirds-style adventurism still holds up really well, and it doesn’t hurt that the serials collected here are illustrated by artistic greats like Kevin O’Neill, Dave Gibbons and Bryan Talbot. The underlying disrespect for the establishment and satirical outlook on authority are trademarks of Mills, and since he handles all of the stories (except for two Alan Moore fillers), this is an excellent sample of the adventures of Ro-Jaws and Hammerstein (geddit?). 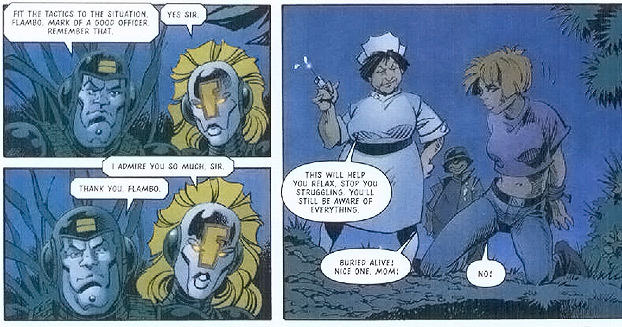 Stand-out tales are Hammerstein’s War Memoirs, featuring the first appearance of the ABC Warriors; the highly sarcastic Death on the Orient Express, where Ro-Jaws can go full out as judge and jury on a bunch of trapped humans; and The Terra-Meks, the legendary and heartrending tale of redundant robot watchtower Charlie. If you are in the mood for some violence flavoured with comical stylings, look no further than this wondrous collection of surly robots struggling with both their own and the humans’ existence. Pat Mills has created a great farcical duo in the potty-mouthed Ro-Jaws and the ever-loyal military droid Hammerstein, whose incorporation into the international rescue squad gives rise to hilarious hi-jinx on an epic scale. 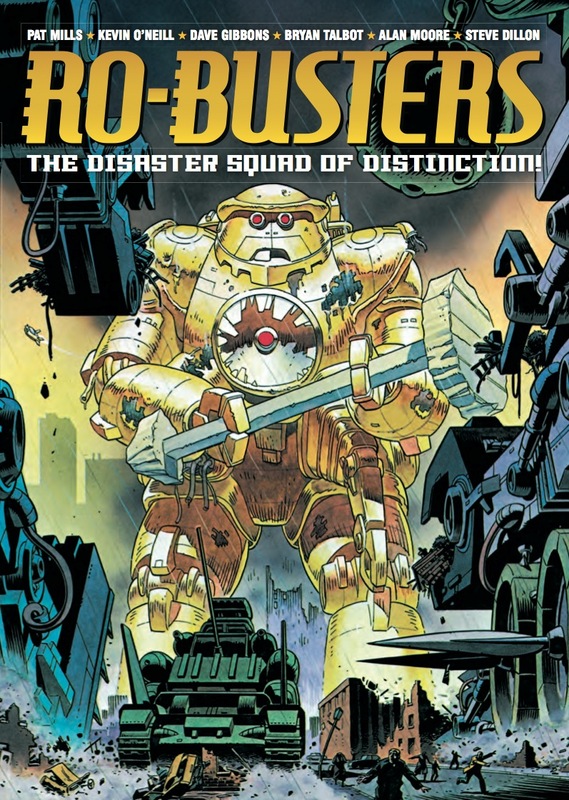 Ro-Busters: The Disaster Squad of Distinction, by Pat Mills, Alan Moore, Dave Gibbons, Kevin O’Neil and Bryan Talbot, is published by 2000AD / Simon & Schuster. It is a black-and-white softcover counting 112 pages and retails for $14.99.